Trestle Theatre: The Man with the Luggage Special Guest Narrator Announced! The Man with the Luggage Special Guest Narrator Announced! This autumn leading theatre company Trestle and the Director of emerging company Blindeye collaborate on the UK premiere of The Man with the Luggage written by award winning playwright Lizzie Nunnery. 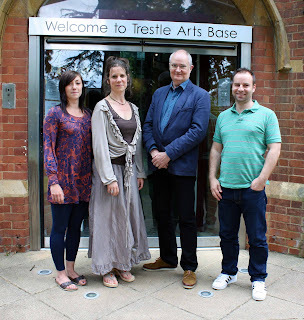 We are delighted to announce that Trestle’s Patron and Oscar Award Winning Actor Jim Broadbent will feature in The Man with the Luggage, as the voice of an old, war ravaged Tree. I have supported Trestle as a Patron for over twenty years and have been delighted by the inventive use of mask, puppetry and storytelling through the Trestle's Masked years and into the Unmasked productions. The last show, The Birthday of the Infanta was a celebration of performance, storytelling and physical theatre; evidence of the Company’s continuing and considerable prowess as a creative force in UK theatre. However, Trestle's unique creativity and ways of linking touring work with participation programmes and a community building are threatened by cuts in government funding. For thirty years Trestle has given the arts community, young people and audiences across the UK inspiration and learning and now is the moment for you to give back to Trestle. Please support Trestle by patronising their new show and donate whatever you can to help Trestle stay creatively vibrant and effective. Anything our supporters can give will make a difference to Trestle’s future. Inspired by the Eugene Ionesco absurdist play of the same name, The Man with the Luggage draws on the themes, and atmosphere of the original piece, but fuses them with contemporary stories of migration and repatriation to create an invigorating, visually stunning, and often very funny stage adaptation, set deep within an imagined European state. The story traces a man’s journey home after becoming a refugee during a war in his homeland. We follow Damir, as he arrives at a train station and starts his tortuous, bizarre, and often hilarious journey back home, to his village, to his house, and to his loved ones. On the way, he is forced to take any means of transport available, from a bus, to a motorbike and side-car, to a solitary roller skate! Through the people he meets along the way, he discovers the true horror of the last ten years, and the divides that are still apparent between different people and neighbouring communities. Make sure you don’t miss this, compelling, highly charged theatrical spectacular! The Man with the Luggage tours the UK from 21 September at Trestle Arts Base in St Albans and finishes at the Marlowe Theatre, Canterbury on Saturday 10 December 2011. Please note that this is a Trestle Unmasked production.